It's been a while since anyone decided to revisit WWII as a setting for a multiplayer FPS. In fact the last one I ever played was Call of Duty: World at War and that came out in 2008 - eight years ago. One of my favourite multiplayer FPSs of all time though, one that I probably spent way too much time playing was an old Half-Life mod called Day of Defeat; this game managed to ride on the popularity of the WWII setting (thanks to films like "Saving Private Ryan") and offer a multiplayer experience like no other. I miss those days and I'm probably not the only one: introducing Battalion 1944, a project by Bulkhead Interactive which seeks to recapture "the core of classic competitive multiplayer shooters" and to introduce the WWII setting to a new generation. To me, that sounds like they're trying to revive a game like Day of Defeat and 10,096 backers thought this was a good idea, raising £317,281 for Bulkhead Interactive. In August, the developers announced that the game was listed on Steam as "Early Access" but the game is still not available for purchase (even in it's Early Access state). There hasn't been much news since then except for them cancelling their appearance at a UK game expo called EGX; unfortunately it was due to tragic circumstances as the senior Producer Joe Brammer and his wife, lost their premature baby in late September. Sad news indeed and consequently it's no easy task to continue on working (which Brammer assures us he is) after you've lost a child; outliving your children is the stuff of nightmares for parents. 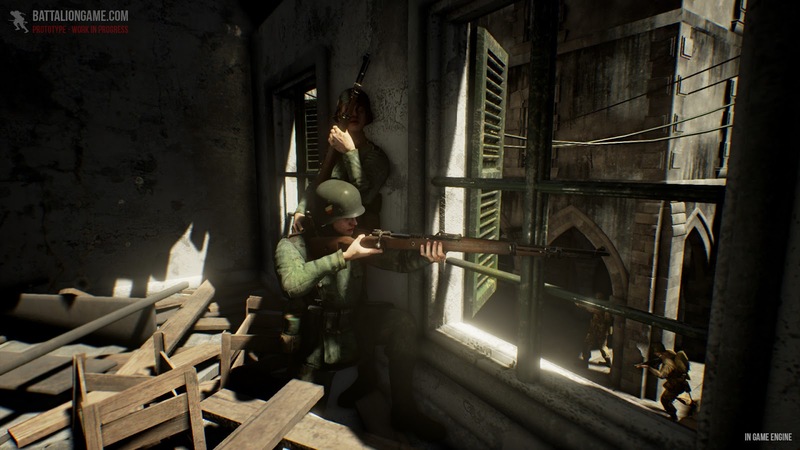 Anyway, fingers crossed that Battalion 1944 will see the light of day next year and it will bring back some of those Day of Defeat players back into the fold. We salute the Bulkhead Interactive team for their dedication and commitment thus far!